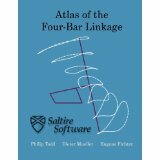 Our Atlas of the four bar linkage covers the same design space as Hrones & Nelson's classic. It is available both in printed form and as an electronic book with interactive diagrams. Containing over 500 diagrams, each of which shows between 5 and seven coupler curves, this book is a great resource for the mechanical designer. 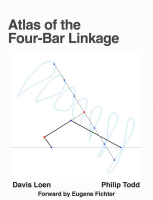 While software can let you examine an infinite number of curves, there is nothing like a physical book for browsing and appreciating the whole range of possibilities presented by the classic four bar linkage. Crank rocker, crank crank, crank slider and inverted crank slider are covered. Our Electronic Atlas of the Four Bar Linkage for your iPad combines the ease of browsing of a physical book with the flexibility of a computer program. All diagrams from our paper Atlas are present, but in interactive form. 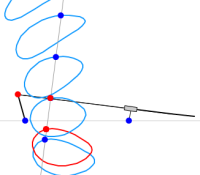 You can animate the diagram, you can change the lengths of the links and placement of the coupler point to examine intermediate forms.